It's been awhile since I did a book review, and I have a significant backlog, so I think it's only fair to finally review a title I've wanted to work with for awhile now. Over the years, I've had numerous opportunities to get involved in a variety of projects and through them, I have become convinced of one thing. Not everyone has the temperament and constitution to be a "Artist" in the classical sense of the word, but everyone has the ability to be creative and create art. I'm using the idea of "art" in this sense the way Seth Godin describes it in his book "Linchpin". We are rapidly developing away from a world where the mass produced and easily reproducible will offer anything in the way of lasting value and personal significance. The ability to create art, and to regularly nurture the ability to create, is going to be the true currency going forward. In short, we will be remembered for the art we create in our lives. Whether that be creative code, creative processes and, yes, even creative testing (and lets face it, testers are creative and make art every day :) ), then it would help to get somewhat in touch with ways to encourage our abilities to develop creativity or make it more of an every day occurrence. 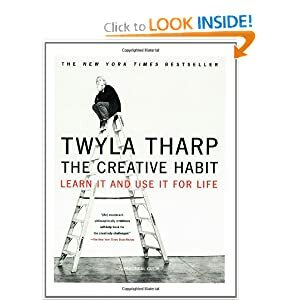 Twyla Tharpe is well known as one of the great choreographers of the 20th century, and yes, much of this book is autobiographical and talks about her approach to dance, choreography and how she manages to develop her ideas. "The Creative Habit" is a discussion on how she goes about creating the art that is her life's work. If you think "well, I'm not a dancer, so this book is irrelevant to me", you are missing the point. This isn't a dance book. The ability to take her suggestions and ideas and apply them may require some reworking or tweaking to fit your own context. The truth is that, to be creative, you have to have a tolerance for the abstract, and understand that there really isn't any way to take something like "creativity" and break it down into a "paint by numbers" format. Having said that, Twyla does offer a number of areas to consider, and provides exercises to apply to your endeavor and see if it fits. The second chapter, Rituals of Preparation, brings the reader through all of the doubts and nay-saying. She uses her own metaphors to show how she addresses the doubts that she has (people will laugh at me, I'm not any good at this, I don't have the talent to do this, I don't have any good ideas) and systematically dismembers each argument :). She also makes the point that part of the ability to create is the ability to put down other distractions and interference (she is not a fan of multi-tasking). To create, often the first step is giving up something else (typically temporarily, but hey, you may surprise yourself). What is the best idea you've ever had? What made it great in your mind? What are your habits? What patterns do you repeat? When faced with impending success or the threat of failure, how do you respond? At what moments do you feel your reach exceed your grasp? What is your idea of mastery? The key to the title is the word "Habit". Most of the ideas in this book are meant to help the reader make a commitment to develop their creativity, so that it becomes ingrained in them. In truth, I think that's an apt word, since Creativity is often sold to us as some rare gem that people either have or do not have. It's not true; everyone has varying levels of creativity in different areas. Whether you draw, write prose, create code, design web pages, sculpt, dance, or fill in the blank, the ability to create requires practice. It requires repeated effort. Twyla uses the metaphor of a box, and that everything she creates has a box and a way to keep the details about what helps her create a dance stored in that labeled and well tended box. Jerry Weinberg talks of a similar method he calls "Fieldstoning". It's the same idea with different terms; the point is that we need to have a way to gather, categorize and process the inputs we get to make something, whatever it may be. Once we have gathered our materials, it's time to start doing some arranging, or "scratching" as Twyla refers to it. She shows and exercise with a number of coins and the ability to arrange them in a number of different ways. the point of the exercise is that, with just a handful of coins, you can create a near infinite arrangement of the coins, and each will be different from the last one. Still, to make those unique arrangements, you as the person doing the exercise still have to move the coins. Creativity is not an ethereal spirit, but a craft, like plumbing, woodworking, construction, or automobile repair. It's a skill that can be developed, nurtured and learned, but to get good at it, it has to be practiced, in whatever area that you wish to have it work for you. My creativity may not be applicable to your creativity. Some exercises will be right on the money, and some will feel odd and disjointed, and that's OK. For those looking for a literal soup to nuts approach to turbocharge their creativity from the ground up, you may find this title lacking. If, however, you can appreciate the context in which you wish to apply your own creativity, and can tolerate some vague and possibly not totally applicable content, but can consider the ideas and morph them to your own endeavors, then there's a lot to like in The Creative Habit, and a lot that can be applied to whatever endeavor you aspire to.